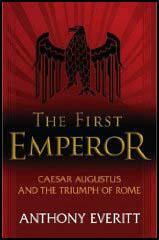 With the growth in the empire, the number of slaves in Rome grew rapidly. Roman generals in their campaigns abroad sent back thousands of captured soldiers to be sold as slaves. 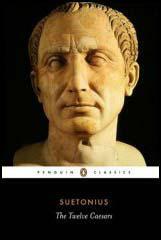 In the campaign against the Gauls (59 to 51 BC) it is reported that Julius Caesar and his army over a million people were captured as slaves. The demand for slaves in Rome had also grown during this period. As more and more men were now needed for the army in order to extend and maintain the Roman Empire, there were fewer men available to work the fields. Slave traders would follow the Roman army abroad on their campaigns. After a battle they would buy the defeated soldiers and their families, and then arrange for them to be sent back to Rome and the other major settlements in the empire. Prisoners were taken to the slave-markets where they were paraded naked, with placards around their necks explaining their best and worst qualities. If information on the placards was later found to be untrue, the buyer could take the seller to court. Slave prices would depend to a large extent on how many were available. After a successful military campaign, prices would fall. Whereas after a long period without war, prices would increase. 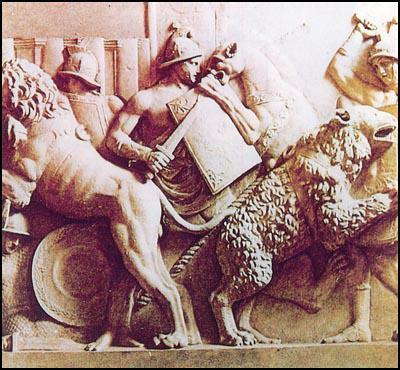 Sculptured relief of slaves fighting wild animals in the Roman Games. A skilled labourer would fetch 2,500 denarii, while a rich Roman would pay as much as 6,000 denarii for an attractive young girl. Greek slaves were highly valued as they were often well-educated. Greek slaves were used by the rich as teachers, doctors and librarians. They also acted as private artists and musicians. Rich families would also use slaves as bodyguards, cooks, waiters, doormen, cleaners, gardeners, hairdressers, dressmakers and maids. Rich Romans were usually large landowners so they also had slaves working on their farms. It was common practice to have them in work-teams of ten slaves. Branded on the forehead, chained together and guarded by a foreman carrying a whip, there was little chance of escape. Slaves who did manage to run away were guilty of theft (they had stolen their master's property), and if caught they would suffer terrible tortures as a means of frightening other slaves. There were also several slave revolts. The most famous of these was led by a slave called Spartacus. He was a shepherd from Thrace who had been captured by the Romans and sent to Capua to become a gladiator. In 73 BC Spartacus and eighty companions escaped from the gladiatorial school. The group then ambushed a convoy of carts taking weapons to another town. When other slaves in the area heard about the success of the revolt, they ran away from their masters and joined Spartacus' campaign for freedom. During the next two years Spartacus' slave army defeated four Roman armies. After two years Spartacus' army numbered 90,000 men and controlled most of southern Italy. However, they were unable to break out of Italy and reach their homelands. In 71 BC the Roman senate sent a large army to deal with Spartacus. Outnumbered, Spartacus' army was defeated at a place called Apulia. The 6,000 slaves who were taken prisoner were crucified along the Appian Way (the main road into Rome). Their bodies were left to hang on the crosses for several months as a warning to other slaves who might consider the possibility of rebelling against their Roman masters. Not all slaves were treated badly. The master of Terence, an African slave, was so impressed with his intelligence that he educated him and then set him free. Later he became one of Rome's most important writers. Some Romans believed that you would get more work out of slaves if you treated them well. They would pay a small allowance into a fund for their slaves. When there was enough money in the fund the slaves could buy their freedom. As the owner could stop paying the money into the fund if the slave misbehaved, this system was a good way of achieving complete obedience. Also, the owner could arrange that slaves would only have enough money to buy their freedom when they were too old to work. The man could then use the money to buy a new young slave while the old slave, unable to work, would be forced to rely on charity to stay alive. The government also owned slaves, and used them to provide public services. They built and maintained roads, bridges, aqueducts and bath houses. Slaves are also reported to have made several important inventions. In fact, what we now choose to call the great Roman civilisation was based on the labour and skills of slaves. After Emperor Constantine became converted to Christianity, the life of slaves improved slightly. For example, a law was passed in AD 319 that made it illegal to kill slaves. Owners of slaves were also forced to stop branding their slaves on the face and instead had to put their mark on the hands and legs. However, Christianity did not bring an end to slavery. Christians argued that Jesus never criticised slavery in his sermons. The Church not only refrained from attacking the system of slavery but continued to use large numbers of slaves to work monastery lands. The Romans were not the first people to use slaves, but no one in history has relied on them as much as they did. It has been estimated that when the Roman Empire was at its most powerful, two million out of the six million people living in Italy were slaves. Their skins were seamed all over with the marks of old floggings, as you could see through the holes in their ragged shirts that shaded rather than covered their scarred backs; but some wore only loin-cloths. They had letters marked on their foreheads, and half-shaved heads and irons on their legs. Dasius has bought and received the slave Apalaustus, nationality Greek, for six hundred denarii from Bellicus son of Alexander... This slave is guaranteed... free from theft and not a wanderer, fugitive or epileptic. Women slaves ought to be rewarded for the bearing of a certain number of children. I have granted exemption from work and sometimes even freedom after they have reared many children. You will get a gold solidus if you return me to my master Zoninus. shoulders, each man forming part of a human chain working in the dark, only those at the end seeing the daylight... men may not see daylight for months on end. You have as many enemies as you have slaves. Slavery is an institution... by which a person is put into the ownership of somebody else. Slaves are so called because commanders generally sell the people they capture and therefore save them instead of killing them. On one occasion a proposal was made by the Senate to distinguish slaves from free men by their dress; it then became apparent how great would be the danger if our slaves could count our numbers. 1. Explain why the Romans were so keen to buy slaves. 2. Imagine you are a historian who wants to find out how the Romans defended their right to have slaves. Which of the sources in this unit would help you answer this question? 3. Give as many reasons as you can why some Romans allowed their slaves to buy their freedom. Which of these reasons would have been the most common? 4. What kind of sources would you need to look at if you wanted to find out what slavery was like in Ancient Rome?